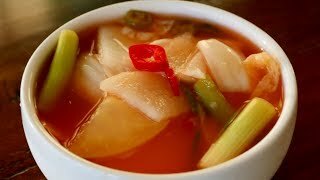 Today’s recipe is vegetable and fruit water kimchi called nabak-kimchi in Korean. It’s fruits and vegetables fermented in a spicy rose-colored brine: savory, refreshing, tangy, cold and delicious with a little bit of heat. Koreans serve this kimchi as a side dish to rice, but also rice cake, porridge, and steamed sweet potatoes. It’s a good substitute for soup or stew. You can make it anytime year round but peak season for radish and cabbage is fall, so that’s the best time to make it. 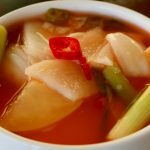 Unlike traditional Korean napa cabbage kimchi, nabak-kimchi will go soggy over time because it contains fruit and cucumber. It’s better to eat it quickly once it’s fermented, in a week or two. You can also eat it before it’s fermented: it won’t be sour and tangy at all, but it will be crisp and refreshing. Cut the cabbage lengthwise into quarters and then trim the stem ends. Cut each quarter crosswise into 1½ inch slices so that each piece of cabbage is roughly 1½ inch square. Put them into a large bowl or basin. Add 3 cups of water and 3 tablespoons of salt to the basin and gently mix it all together with your hands. Let stand for 30 minutes, then gently toss the cabbage and let stand for another 30 minutes. Cut the radish into bite size pieces thinly. Put them into a bowl and mix with 1 teaspoon salt. Let stand for 1 hour. Rinse and drain the cabbage in cold water a couple of times, changing water to remove dirt and excess salt. Drain and transfer to a large basin. Add the radish (with its salty brine), to the basin with the cabbage. Add the cucumber, onion, green onion, green chili pepper, red chili pepper, apple, pear, garlic, and ginger, and mix everything together with your hands. Combine 10 cups water and ¼ cup salt in another large bowl and stir well to dissolve the salt. Tie the hot pepper flakes up in a piece of cheesecloth. Immerse the cheesecloth pouch in the water and squeeze the pouch several times, until the water turns pink. Remove and discard the pouch. Pour the pink brine over the vegetables and fruits in the basin. Stir well with a wooden spoon. Transfer to a airtight container or glass jars. Press it down gently. You can serve immediately with rice, or cover and let stand at room temperature until it ferments and gets a little bit sour, usually between 1 to 2 days. Serve in individual bowls, or in one shareable bowl on the table. Posted on Saturday, October 7th, 2017 at 7:39 pm. Posted November 7th, 2017 at 4:30 pm | Log in to reply. This is such an interesting idea to use fruit. Please check out my mother-in-law and my blog. We have a traditional version in Korean. Posted October 9th, 2017 at 11:54 am | Log in to reply. Posted October 23rd, 2017 at 9:33 am | Log in to reply. Hi Yostina I can help you in something. Posted October 23rd, 2017 at 10:29 am | Log in to reply. Thank you Sio lover, I’m going to try it. I asked about different vegetables because me any my family don’t digest cabbage very well hahha. But I still want to make it with cabbage though so I’m gonna try it. Posted November 21st, 2017 at 11:01 am | Log in to reply. This recipe was originally posted on October 7, 2017 at 7:39 pm by Maangchi. The video was watched 346,239 times on YouTube & has 8,536 likes!